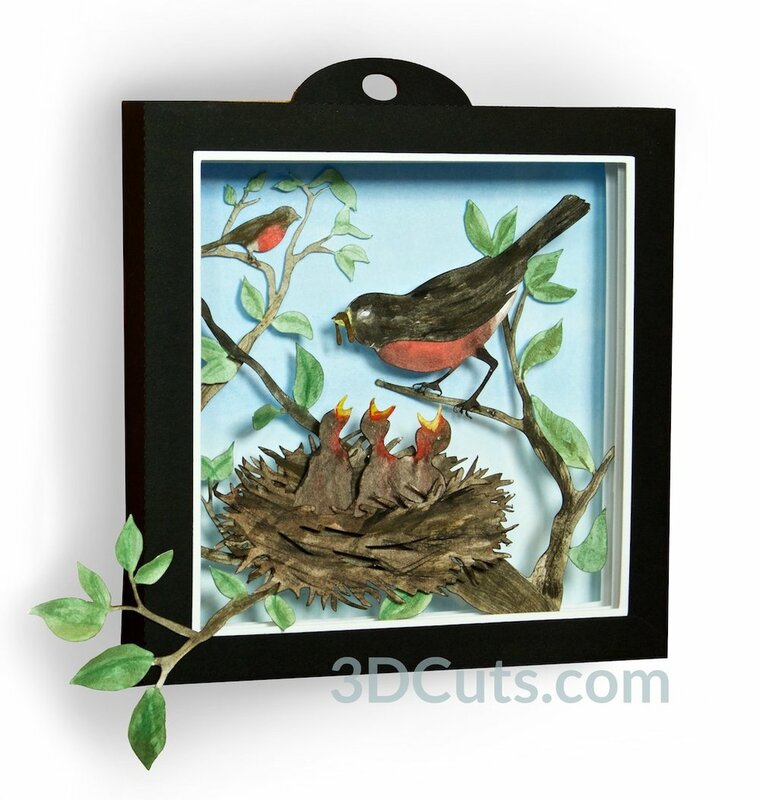 This tutorial is for the 4 layer Springtime Robins shadow box designed by 3Dcuts.com. This shadow box is a little different from many of my other designs in that all the details are added to the shadow boxes during assembly, not during cutting. I have also added an optional cover mat. Customization is possible through choices of paper and techniques. I used a water color wash on white paper to create this effect. 8.5 x 11" card stock - I used the 65lb Cardstock from Recollections for colors and Neenah 110 Index Card stock from Amazon for white. Back Ground paper: Be creative I used a water color wash. Paper needs to be cut to 6 1/8" square. Special Note: I update the instructions online. Check here for adjustments and additional information. Don't just rely on the pdf file that comes with the download. Learned hints are added to the end of the tutorial. You will notice I have made this shadow box in 3 different ways. Choose your own papers and blend them with other techniques to add creativity to this project. Water Colors: I added a water color wash to the back ground and all detail pieces in one of my renditions. I used ordinary water colors on my card stock. I allowed it to dray and then pressed in flat under weight overnight before assembling the shadow box.